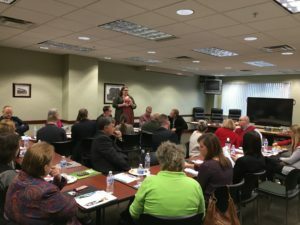 Carla Hinkle, Workforce Development Manager for Defiance County Economic Development held a lunch and learn event for business employers and school officials on Wednesday December 12th. Those attending were informed of several opportunities being offered to help with workforce efforts in the county. Darrell Handy of the Defiance Chamber of Commerce spoke about the opportunity for employers to post job openings to their website job post board that is up and running at this time. Kaylea Scott of OMJ/Impact419 Program is the case manager and she informed all of the program guidelines and how she works with the youth to help prepare a career pathway and work on soft skills. Andrea Morrow and Jim Drewes from NSCC told the group about three new 8-week course offering that are going to be rolled out in February. Those 3 classes are Basic Construction Management, Automotive Technician and Autonomous Maintenance. Employers are encouraged to seek out this opportunity to upskill their current workforce. Eric Sprague, Defiance Middle School Career focus instructor gave an overview of how they are starting young to prepare the students to start thinking about careers. The students prepare an OMJ backpack online and take a career-based survey to see where in the 16 career categories they fit and might have interest in. Students go on a job shadow that they must find and connect with the employer and provide their own transportation to and from. Eric encouraged any business that would like to share with his class to contact him at the school. Please contact the office at 419 784-4471 for more information. Stay tuned for the next lunch and learn coming in spring of 2019.